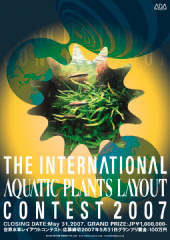 For any of you who feel like putting your aquascaping skills to the test and competing with the world's best, the 2007 Aqua Design Amano (ADA) International Aquatic Plants Layout Contest is now open for applications. More information and application forms can be found on the ADA website. New for this year, you can now apply online as well. There will be one Grand prize of JPY1,000,000 (a little over $8,000! ), one Gold prize of JPY300,000 (about $2,500), two Silver prizes of JPY100,000 (about $800), three Bronze prizes of JPY50,000 (about $400), twenty Honor prizes of JPY10,000 (about $80), and 100 Winning works which will receive a certificate. Entries must be received before May 31, 2007. Good luck to anyone who enters, and tell us about it, I may even feature your tank!